Hahaha. You totally thought it was gonna be another NCIS post, about my love for Dr. Ducky Mallard, didn't you. Sorry to disappoint. You make bath time, lots of fun! Over and over. And over. 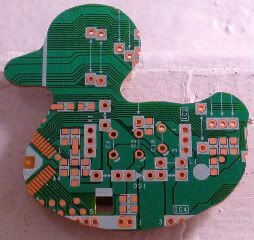 Still, it's a supercute circuit board ducky. Picked it for today, because this day in 1951, the first commercial computer was unveiled. The UNIVAC - Universal Automated Computer, with U.S. Census and Prudential as its first customers. The UNIVAC filled a whole room at 25' x 50'. Feet! And it had an internal storage of a whopping 1,000 words, processing at 2.25MHz bit rate. Compare that to today's technological wonder, the iPad, which can go virtually anywhere at 9.56" x 7.47". Inches! No telling how many words it can hold with a minimum capacity of 16GB, processing at 1GHz. Now. If we could just get those flying cars moving along, we'd be in business. Ha. Thanks for putting that image in people's heads now. Which one? The one where you're a little kid running around singing? Or, Ernie?